March 2 -Dries Van Noten took cues from his latest menswear line on Wednesday for a fall-winter pret-a-porter collection that featured coats with assymetric lapels and jackets in wool and tweed. 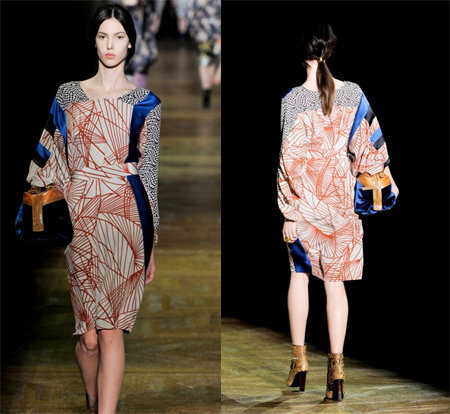 Showing in the Hotel de Ville on day two of Paris fashion week, the Belgian designer sent out a raft of silk prints that could have stepped out of an art gallery, tinges with such novelties as a T-shirt that morphed into a sarong. Trousers were voluminous, more so than others seen so far this season in the French capital, and a psychedlic pattern on a pair of socks inside satin-blue peep-toe shoes was a quirky touch. 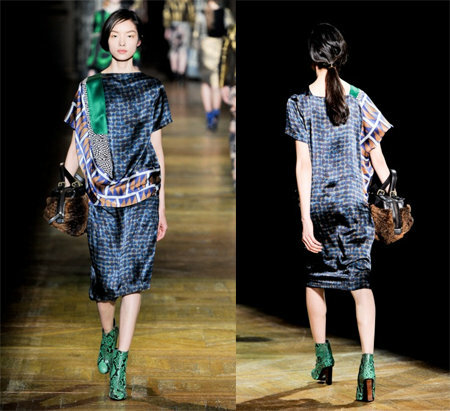 It was hard to make out any connection with David Bowie and the Russian ballet which, Van Noten told AFP backstage after the show, were his prime influences for this season. But the designer had encouraging words for John Galliano, whose abrupt fall from grace at Christian Dior has been the talk of the shows. "I find it all very sad and I hope he comes through," he said in Dutch. Galliano apologised on Wednesday for spewing hateful remarks at a hip Paris cafe, but denied he was anti-semitic, as French prosecutors said he would appear in court by June to answer charges of racial or religious insults. Marcel Marongiu at Guy Laroche drew inspiration from post-World War II expressionist art for a collection that put a welcome shot of colour into what has been so far a rather monochrome batch of opening shows. For his refined yet accessible collection, the Franco-Swedish designer sent out a rich array of red, black and white outfits cut just above the knee, many with assymetric shoulders, including a printed dress accented with a wide belt. Knitted dresses with geometric patterns of black, grey and green -- worn by models with sharp red lipstick and long flowing hair -- best represented Marongiu's hommage to the likes of painters Pierre Soulages and Mark Rothko. French designer Anne Valerie Hash used her own Parisian atelier -- a former brothel turned synagogue -- to present a sophisticated collection best described by an American guest in one word: "Soothing." Soft-shouldered jackets, meticulously tailored, were matched with relaxed cuffed trousers in autumnal colours, with a beige jumpsuit thrown in to close a very zen-like show. Materials included cashmere, silk and velvet. "Softness is something we like," Hash told AFP backstage Wednesday after the show in the cutting and sewing workshop where she works with a close-knit team that is predominantly Japanese and entirely East Asian. "We are in the spirit of today, one in which we adapt because we don't know what's going to happen between economic crises and a world that is changing," she said. "I am someone who needs softness." For inspiration, Hash collaborated with Huang Zhiyang, a Taiwan-born artist living in Beijing whose paintings were made into prints -- "and I'm someone who never works with prints" -- and whose sculptures informed skirts and dresses. Felipe Oliveira Baptista, appointed last year to the creative helm at Lacoste, kept well clear of classic sportswear for his own-label show at the Palais de Tokyo in which he sent out alternating outdoor and indoor looks. 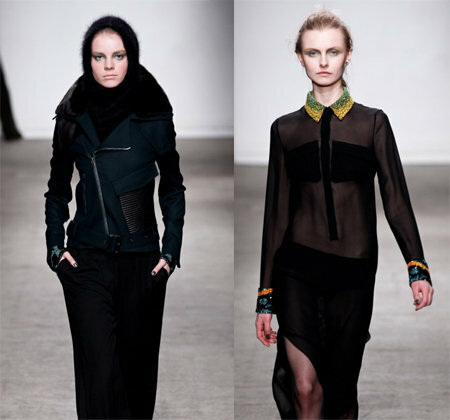 Highlights from the Portuguese-born, British-trained designer included a hooded biker jacket in muted green, a bulky black roll-neck sweater and a variety of little black dresses accented with sequins.